- You can now color bin less than 4 files, if you are not familifying. 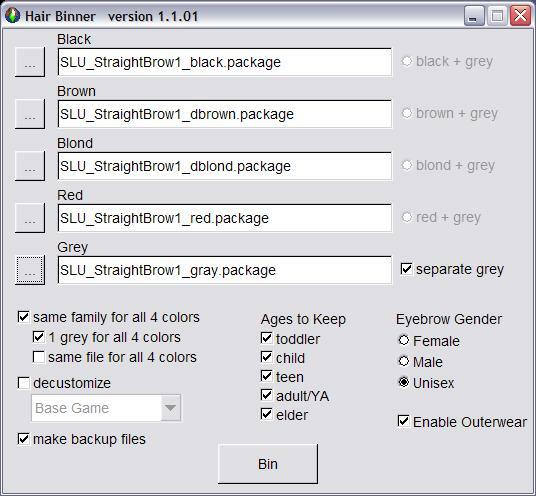 - critical bug fix: If using "1 Grey" on hair where elders had the same color hair as adults, the files would break. (It worked correctly on hair where elders were grey.) This has been fixed. - bug fix: Sometimes unnecessary grey textures remained behind in files, although the catalog had just one grey. This has been fixed. Bin all the hair / eyebrows / beards cluttering your custom color bin! Nice adult hair with boring Maxis child and toddler hair? Remove ages! Got hair that disappears if you change hair color? Familify it! Bushy brows on ladies? Plucked brows on men? Make them ladies/men only! Hair missing from outerwear and maternity? Fix it! Let townies have nice hair too! Do all four colors at once! Do all ages/genders at once! Do binning, 1 grey, familify, remove ages, brow gender, and compress, all at once! Don't need SimPE (binning plugin)! Faster than Wardrobe Wrangler! Windows: Download. Unzip. Double click the *.exe file to run. Do NOT remove the *.dll nor *.manifest files. Mac: I plan to add a Mac version in the future. 1) Select four files (black, brown, blond, red) by clicking the "..." buttons. If you have mystery files not labeled by color, no problem! Just look at the preview picture. If there is more than one texture, the preview will say "image 1 of N". You can see the other textures by pressing the < and > buttons above the file list. Is one of the textures grey? If your black (or brown or blond or red) file does not contain elder grey, and the elder grey is in a separate file, then click the "separate grey" checkbox and select the grey file. If you don't have any elder grey at all, no problem. Things will still get binned. 2) Click the "Bin" button. multiple texture images, use the < and > buttons. Colors appear in the correct bin, black, brown, blond, red, and grey, instead of the custom color bin. Colors have correct genetics, black and brown are dominant over blond and red. Binned hair is available to townies. All four colors share one grey. If each color should have its own different shade of grey, you can turn off "1 Grey", it's optional. Extra greys are NOT just hidden, their grey textures are removed. You truly have 1 grey. All four colors are part of the same family, so the sims hair / eyebrows / beard don't disappear when changing colors! Creators, you CAN have familified hair with 4 different greys if you wish. Just turn off 1 grey. You CAN add more than one brown/blond/red to a family. Simply run binner again, with the same black color as the first time, and then select different brown, blond, red, if you wish. However, be aware that families with multiple versions of a color may not give the color you want when changing hair colors. They're useful if you want to keep the same hair mesh when changing colors, and you have more than 4 colors. NOTE: If you make families of size 4+, and you are doing 1 grey, make sure the elder grey is in the black hair! If checked, black, brown, blond, red (and grey) will all be in one file. This file will have "All4Colors" at the beginning of the file name. If you want to keep your original files, check "make backup files". Without backup files, you will lose your original files. No custom star in the icon. 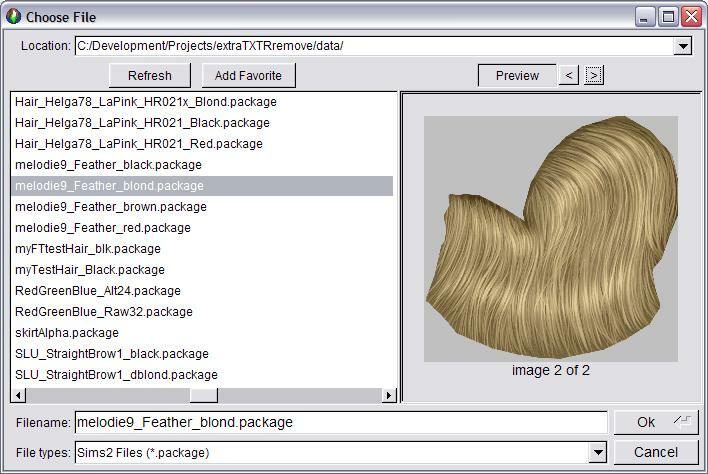 Hair appears with Maxis hair in the catalog. If hair requires a mesh from a certain EP or SP, select the EP or SP from the dropdown box. Any checked ages will kept (if they exist). Ages will NOT be added. Any unchecked ages will be removed (if they exist). Any textures not used any more are removed. Don't want lady sims with huge, bushy eyebrows? Don't want manly sims with dainty, girly plucked eyebrows? You can make eyebrows male only, female only, or unisex. in addition to any categories it was already in. Maternity is always enabled, automatically. You don't have to check anything, it just happens. If not checked, you don't get backup files. There is no control for this, it just happens automatically when the files are written. * Redrawing Bug: Sometimes when selecting files, if you hover over a file, a tooltip pops up showing the file's full pathname. When this happens, the file chooser may have trouble redrawing itself. Just click the file or another file again, a time or two, and it will fix itself. * Don't forget to remove the old *.package files, keep the BINNED_*.package files! * If BodyShop won't start, or you don't see your changes, you may need to remove *.cache files from your EA Games/The Sims 2 directory after binning stuff. 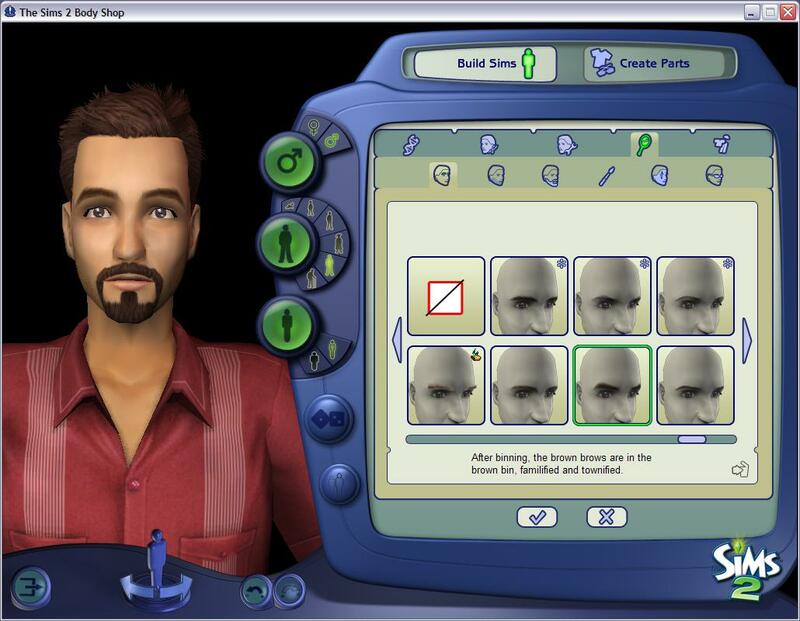 * In game, you might need to have sims use a mirror to change appearance. HUGE THANKS to all folks helping test, making suggestions, reporting issues. Thanks to benrg, whose DBPF compression library I use (as does jfade). Thanks to jfade for the Wardrobe Wrangler, which is still nifty for clothes and accessories! Thanks to the makers of SimPE for a great tool. I used it along with BodyShop to verify that the hair binner works correctly. Thanks to Theo (author of the binning SimPE_plugin) and AmberDiceless at MATY for helpful discussion, long, long, long ago. Thanks to Phaenoh for her very good design suggestions, and for this great hair tutorial. You can now do many of the steps in that tutorial with the hair binner instead of SimPE or Wardrobe Wrangler. If you don't already have jfade's nifty Wardrobe Wrangler, why not? like clothes and accessory binning. Here is Theo's very nifty binning plugin for SimPE .